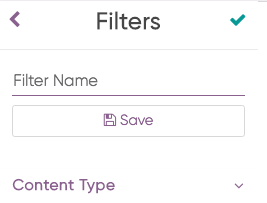 The filters drive a great way for team's to organize and track all of the various marketing efforts. The filters are customizable and can be set up in the calendar. To filter the calendar, you will need to click on the views section (in the top right) and then hit the + button. Once you select the + button you'll be prompted with a selection of fields. Each account will vary calendar-to-calendar as these fields are customizable. 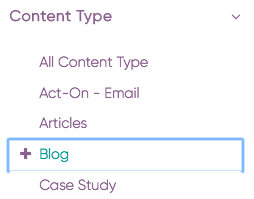 You'll see in the example below, there's the Content Type drop down, you can select this field and then the accompanying field options (the various content types) will display. If you click on a field once, this will select that field and display a + sign next to it. If you double click on a field, this will deselect that field and display a - sign next to it. This will exclude it from the calendar view. By clicking twice on an option within a section you're choosing to "exclude" any content item that matches that choice. 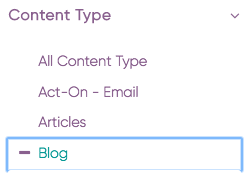 For example, if you select all Articles and Posts, but exclude Landing Pages, anything that is tagged as both an article and landing page will be excluded and you will only see those tagged article. 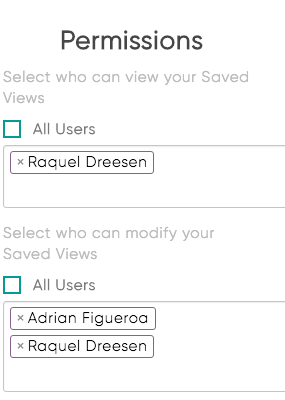 To save this view, create a filter name and hit save. Once you hit save, you can customize who can see the view.